UNCASVILLE - Kiah Gillespie and her Capital Prep of Hartford teammates remembered the terrible feeling of they experienced losing in last season's CIAC Class S final. The Trailblazers made sure that they never gave Thomaston a chance in Saturday's final. 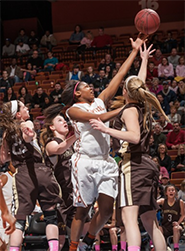 They blitzed the Golden Bears early and won, 84-55, in the Class S final at Mohegan Sun Arena. 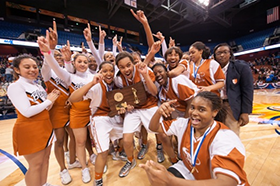 It was the first state title for top-seeded Capital (25-2). Its only losses were out-of-state. Gillespie had 22 points and 14 rebounds for the Trailblazers while Desiree Elmore added 13 points, 11 rebounds and four assists. Shaquana Edwards added 18 points for Prep and Taylor Williams scored 11. Abigail Hurlbert had 28 points, 10 rebounds and four steals for No. 3 Thomaston (23-3). Prep lost to Coginchaug of Durham in last year's final, 58-48. "I came in as a freshman phenom last year (and) took it to my head," Gillespie said. "Doing that, I did nothing. This year I was the captain, the leader. I had to do what I had to do so that my team won." The Trailblazers took a 7-0 lead a minute into the game. They pushed their edge to 23-5 before the first quarter ended, their largest lead of the game. "It's a whole different perspective winning," Gillespie said. "It's a really great feeling. This smile is going to be on a face all day." Capital coach Tammy Millsaps didn't think last year's schedule prepared her players for a state final. She strengthened it by playing the likes of New York's Archbishop Malloy and Bishop Ford Central Catholic. Prep also played Southern Connecticut Conference champion Career of New Haven and won, 76-57. "Sometimes people say that, 'we deserved to win the state championship," Millsaps said. "We deserved it. The hard work we put in all year; the opponents that we played. We wanted to play some tough teams. We put our neck out there, so to speak. We easily could've went and played some teams that maybe we could've beat, but we didn't. "I think this year that we earned it. We deserved to win the state championship." Prep pushed their lead to 23-5 in the first quarter, their largest lead of the game. It pressured the Golden Bears into 23 turnovers and scored 35 off of them. Thomaston and Career were the only Connecticut teams to score 50-or-more against the Trailblazers. "We're not going to go out like that (by giving up)" Golden Bears coach Bob McMahon said. Points in the paint-THOMAS 20,CAPPREP 38. Points off turnovers-THOMAS 13,CAPPREP 35. 2nd chance points-THOMAS 7,CAPPREP 22. Fast break points-THOMAS 0,CAPPREP 12. Bench points-THOMAS 4,CAPPREP 19. Score tied-0 times. Lead changed-0 times. Last FG-THOMAS 4th-00:58, CAPPREP 4th-00:18. Largest lead-THOMAS None, CAPPREP by 34 3rd-00:22. Technical fouls: Thomaston-None. Capital Prep-None.